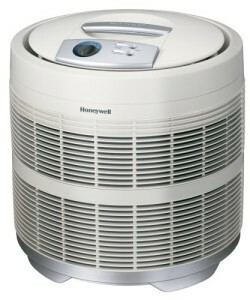 Honeywell HEPA filter air purifiers have really hit the mark when it comes to quality air filtration on a budget. They have used a rather clever (and patented) 360-degree air-intake and exhaust design in many of their leading models. Basically, this just means that they are super effective at circulating and replacing the air in a room. I feel like there is not much point going over all the wonderful benefits from having a HEPA filter air purifier in the home (you probably wouldn’t be reading this if you didn’t already know that). HEPA filters are the gold standard when it comes to filtered air purifiers, so you know you will get quality results. The real question when deciding which purifier to buy comes down to a couple of factors which determine how effectively the HEPA filter gets used. The Honeywell HEPA air purifier (50250-S) has been a long standing best-seller and receives many glowing remarks from satisfied customers. Although this model has the price tag of a much smaller air purifier (about $125), it’s efficient air circulation capabilities mean that it can easily handle large rooms. Best-suited to a room of approximately 235 sq. ft. (15 x 15), however can handle much larger or can be moved around quite easily between small rooms. So, we’ll give you an idea of just how quickly the Honeywell round air purifier replaces air in a room. A pretty large room, 390 sq. ft. in size (with 8 ft. ceilings) would have its air changed 5 times per hour. A smaller room, just 80 sq. ft. would have its air changed 23 times in an hour. So the suitability of this purifier really comes down to the environment it is in and how often the air needs to be replaced. If you’re in a room which has a constant stream of pollutants being added to it (has a few pets or a smoker) then a small to medium room might be optimum for this model. On the other hand, if you are in a fairly large room which is well sealed off from external sources of dust and pollen, this purifier is easily up to the task. Now, down to the rest of the crucial details about this purifier. Honeywell provides a 5-year warranty on this model. The HEPA filter can be vacuumed to extend its life and is suggested that you will get between 3 and 5 years use out of it before it needs replacing. The replacement HEPA filter will set you back around $40 when you get to that point. It is also equipped with a carbon pre-filter, this is used primarily for odor removal, so is kind of like an optional extra. 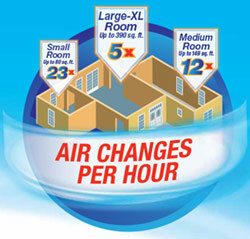 It is recommended that these get replaced every three months for optimal odor reduction. They will set you back around $8 if you’d like to replace it. All in all, it is a solid HEPA filter air purifier and should be considered by anyone wanting effective air filtration without having to fork out thousands of $$$ for it.